A product owner or entrepreneur should consider the user behavior before starting the mobile app development process because identifying the targeted user and implementation of features and user interface accordingly marks the half thing done in the success of a mobile app. Mobile phones which we are using holds an integral part of our daily lives and we are more heavily relies on the applications to accomplish our day to day activities. A survey flashes on the fact that people are spending more time on their Smartphones for getting their most of the task done. People now spend 50% of their digital media time on Smartphone apps and people most often access 20 or fewer apps in a month. But they positioned them on their screens in a way that makes them accessible. And guess what? The more interesting fact about apps is that- choice of Smartphones and mobile platforms flashes behavior, habits, and personality of users. 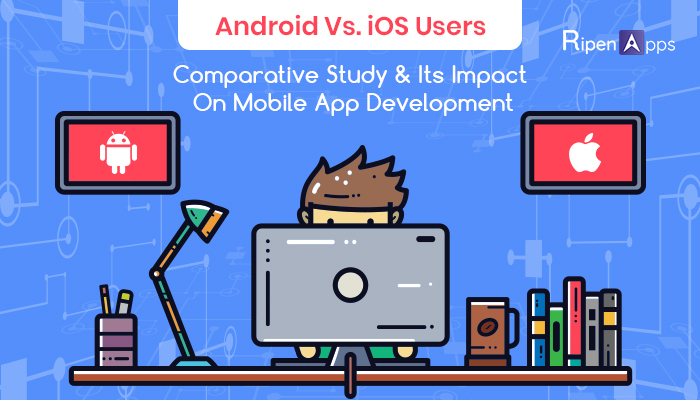 Through this blog, you will be able to understand the different context of your app may face between iOS & Android users. Interestingly, Android and iOS users are two poles apart. They have a completely different understanding, which reflects in their behavior too. The human behavior is a prime factor to give direct impact on their personal choice and approach to address a particular problem. In this article, we are discussing the behavioral aspects, which make an impact on the mobile app development process. Among this coverage, Android holds a major portion around 72% which is alternately higher than iOS. If we look at statistics again, then the first quarter of 2018 experienced a 25% hike in users on Google PlayStore. IOS is not that far as they experienced a 21% hike on their App Store in the same quarter. But it is not enough to choose a platform. In order to opt for a platform for a mobile app development process, one should clearly know how these markets operate. Android is affordable as an open-source platform, but iOS has generally better revenue, so companies need to be careful here. According to Morgan Stanley survey, right from the commencement of Android, iOS technologies, 92% of iOS users say that they would be likely to return to Apple for their next device. When it comes to Android users, the same question was asked of them and there were only 77% Android users likely to return to Android again. This statistics shows that iPhone users are incredibly loyal to their brand. This aspect shows that the future of iOS is higher than Android. This behavior of user provides ease to developers or mobile app development companies to take better care on iOS app development and android app development. Device engagement is the personal engagement of users towards their phone. It decides the success of the platform or the respective apps. If we talk about the device engagement, then iOS is on the lead. According to Experian, a global information services group, iPhone users spend 26 more minutes a day on their devices in comparison with Android users. They also spend more on mobile commerce on their iPhones. Now let’s evaluate this to Android, the number goes down because of less engagement with the platform as compared to iOS. These factors can be a challenge for developers to develop an app to increase the engagement rate of Android & iOS app users. At the point when a user chooses iOS over Android or the other way around, this has a noteworthy importance. IOS users find the security in front of anything, however, that doesn’t imply that Android users don’t have security concerns. They do have an alternate standard here. Apple takes after a strict routine with app submission, push notification, and timeframes for system updates on App Store. This makes them the more secure and more secure platform. IOS app-based devices are simple and smart and they keep the app as a solution supplier. Android apps have an alternate approach. They can be uploaded and submitted openly. Mind you, Android has a larger user base, which makes it somewhat more vulnerable contrasted with iOS. The user is totally unique among these two noteworthy OS. While focusing on the iOS app, mobile application developers need to configuration considering the personalities qualities of iOS users: basic, unique and problem-solving. Android users center on particular features and they prefer to get things for free. For instance, song downloading is paid on iOS, however, can be free for Android. The mobile application development process should center on by keeping the device and platforms in mind. The income groups are different when it comes about these two different major mobile OS platforms. There is a huge gap between the spending behavior of iOS and Android users. IOS users have a habit of spending more compared to Android users. Specifically, they have more purchases than Android users. Meanwhile, 41% of iOS users earn at least $100,000 in annual income and tend to be early adopters that want more out of their Smartphones. Greater levels of engagement suggest that iPhone users are deriving more value out of their devices. Therefore they are more likely to pay for applications that increase the capability of their Smartphone. This has a direct impact on the revenue generation of an app. If the app is meant to generate more revenue, then iOS is an automatic choice. However, if the plan is to target masses only or if the app focuses less on revenue, then Android might be the right choice. Best Android & iOS mobile app development companies keep this constraint in mind before going in the development phase. With the growth of both Google’s PlayStore & Apple’s AppStore, the ideal mobile app development path one should choose is hybrid app development for both platforms. Most of the apps can run over both platforms including iOS & Android and it also is easy for developers to develop a single code or make it work on both platforms. Android: if you are focused on android app development then the target audiences would be focused on Android, as well as when you are focusing on customizing Android user experience and adding to the personalization power that Android has. iOS: First makes sense when your goal aligns with the user spend, high in-app engagement & loyalty that makes iPhone users valuable, Apple has also reduced approval times and time to market is working to your benefit. This could be difficult to say that which platform is right whether iOS or Android. The great approach is to go with both of these platforms. As it gives an opportunity to directly tap 99% of the market in one go. If it is found to develop an app gets developed on both platforms then these mentioned factors should be kept in mind. This will make the decision process easier. Still having confusion for which one you have to go? No issues, we are right here to help you out. Our enthusiastic team of the research analyst is always eager to help you out in choosing the right platform for your business growth. Contact us now! and feel free to discuss.